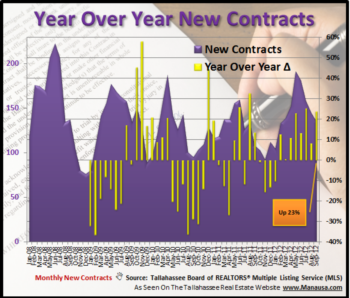 The pending home sales graph below shows the 365 day trend analysis of new contracts submitted to the Tallahassee MLS. By measuring new contracts, we get a feel for what is coming over the next few months. If you saw the most recent post on closed home sales, then this report will give you an idea of how it will shake out over the next two months. 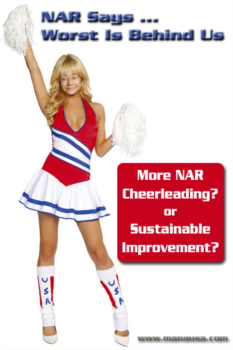 Unfortunately, the trend is on the decline. Remember, when we look at a 365 day trend, it shows the real market activity with seasonality removed (each point on the graph represents one entire year), thus when we observe the market falling, it is not because of the time of year. The graph above shows that things have not been looking so great in the Tallahassee real estate market since the end of the Homebuyer Tax Credit. I believe the main problem with the market is that 2/3rds of our traditional buyers come from Tallahassee as sellers first. Since many people are trapped in homes that are worth less than their mortgage, this group of buyers cannot move as they are failing to sell their homes. If you find yourself upside down in your home and want to know what your options are, download our free copy of Should I Short Sale My Home, an 81 page e-book that explains some of the other options that you might be able to take advantage of. Who knows, maybe you'll be in a new home sooner than you thought possible.